In the second half of our “Foster Families of 2016 Litters” spotlight, we are recognizing Justine Smith for her dedication to fostering Dolly and her pups! Dolly was found in San Bernadino as a stray. TRD had to spring her from the Devore shelter when we learned she was on the euthanization list for “medical” problems—she was pregnant! One look at her sweet Beagle mix face and she became a TRD dog. 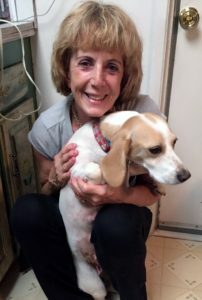 Scrambling to find a foster family for a pregnant pup, Jessica van der Stad (July Spotlight Volunteer) agreed to take Dolly until we found someone more permanent. Justine came to the rescue and offered to foster this little family. Justine was born in Ithaca, NY and moved to San Diego when she was just six years old. Her very first pet was an albino guinea pig named Herman. Justine, a Certified Nursing Assistant, worked for Scripps for many years before raising her family. For the past 16 years, Justine has worked with developmentally disabled adults. Her mornings consist of working in a group home making sure the residents are cared for and loved by helping blind, deaf, autistic and physically disabled adults with their activities of daily living. Justine’s experience as a CNA, her huge heart, love for animals and intense mothering instinct made her a natural at being an amazing foster mom to Dolly and her pups! Justine’s human family consists of her husband, Danny, her three children: Jason, Joslyn and Amy and her two grandsons, Jerald and Travis. Justine and her husband’s animal family include their two dogs; Kimo, 10 and Bentley, 2 (a foster failure from TRD), two cats; Oliver, 10 and Lucy, 5, a 10 year old snake named Jedi, a 17 year old Iguana named Lola, and a part-time dog, Zoe Anne, who lives with Justine’s daughter most of the time. Justine’s desire to foster dogs began after taking a veterinarian assistant course through the Grossmont ROP program. 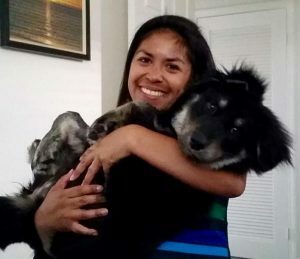 She did some on the on the job training through the San Diego Humane Society and it was there she fostered bunnies and a pit bull named Migo. Lucky us, Justine joined forces with TRD about a year ago. Her first foster with us, Penny, was a bit of a handful but she got some great training from Fernando with Canine Education and she was soon adopted. When presented with the opportunity to foster Dolly and her pups, Justine wasn’t sure what to expect but she knew she had more free time than most other fosters and that would be an asset with puppies, so she jumped in to help! 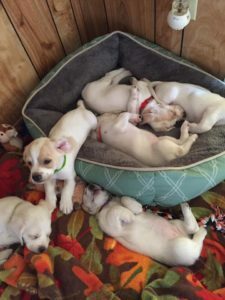 The biggest challenge for Justine fostering puppies was generally making sure they were happy and healthy. She says, “It was like having a new baby x7!” Justine loved Dolly’s natural instinct to protect them and said she was a wonderful mama who did most of the work. Justine’s strong mothering instinct herself created a very tight bond with Dolly and thought of the pups as an extension of her motherly love. Justine will always have a special place in her heart for Dolly because of their deep bond; she cried when Dolly left and still misses her. The most rewarding part of all this hard work was watching the puppies learn how to walk, eat, play and bark. 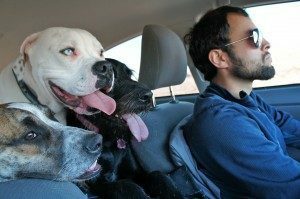 Initially, they had no idea that they were the ones making that barking noise! The older they got, the more responsibility they were, especially keeping them safe and out of trouble in true puppy fashion. Justine, from our hearts, thank you for being so dedicated and loving to Dolly, her pups and all the other foster dogs you open up your home to. 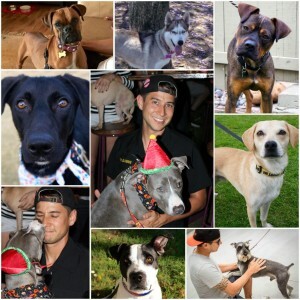 We are so grateful to have you on our team providing such amazing care to so many TRD dogs!